The connection between the tarot cards can best be seen using the Grand Tableau method. The Grand Tableau is more commonly used in the Lenormand card tradition, however, it can be applied to tarot cards as well. In fact, you can read the whole deck this way. I recommend narrowing down the deck in it’s 5 major groups; Major arcana, wands, swords, cups, and pentacles. This way you will easier be able to read the cards. In this post, I have narrowed down the Minor Arcana suit of Wands. Remember: Cards that fall in its own position is intensified. Sometimes cards cross over and fall in its others position, for example, ace of wands falls in five of wands and five of wands falls in ace of wands. When this happens take extra notice. These synchronicities happen for a reason. The answer to your question often lay within these synchronicities. Learn more about Wands tarot card meanings here. Tip to the reader: I always look at the cards that are relevant to my question. For example, if you are asking about travel then look at the Eight of wands position. What card landed there? Also, look at the card position represented by the card in that position. 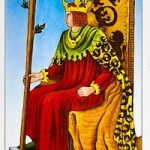 For example, if Six of wands landed in Eight of wands I would also look at what card fell in the Six of wand position. They are all connected. You can take it one step further and look at the card that fell in the last card position all the way until all card positions have been covered. Let’s say Ace of wands landed in the Six of wands position. You will then go and examine the Ace of wand position next. The Suit of Wands in the Grand Tableau is best used when your clients want to know about projects, starting something new, interests, passions, career change, entrepreneurial endeavours and any kind of adventures.